Child-appropriate Halloween movies can be much harder to find than R and PG-13 scary movies, but they’re out there. Last year, we rounded up the top-searched scary movies for kids to stream, and in our second annual report, we’re widening that net to all kids Halloween movies. 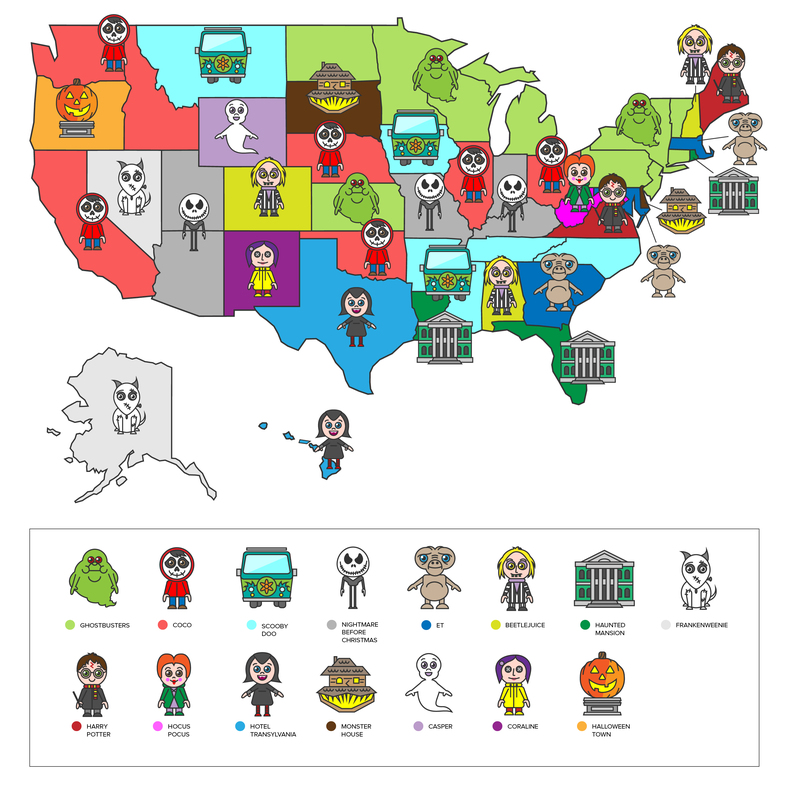 Think you might know which scary movie for families was most popular in your state this year? Make a quick guess and then check below to see if you got it right. Part of the 1998 classic HalloweenTown was filmed in St. Helens, Oregon, and every year the town relives its stardom with a month-long festival called Spirit of Halloweentown. No wonder Oregon searches for this movie more than any other state! Fun fact: Parts of the Twilight series were also filmed in St. Helens. The movie Coco was the top-searched movie in California. With Coco being based on the sacred Mexican holiday Día de Muertos, perhaps the many Californians of Mexican ancestry1 appreciated the chance to see their heritage represented on screen. People in Wyoming love the adorable hauntings of Casper the friendly ghost—maybe because he shares the name of the second-largest city in their state. People in New York searched for the 1984 classic Ghostbusters more than any other state did. The movie also takes place in New York City. In these states, the most-searched movie was the same in 2018 and 2017. We tracked Google search data from the past year on children’s Halloween movies rated PG or below and selected the top 18. We then ran the search volume of these 18 movies in every state and reported only the movie with the highest volume. One difference from last year: our first report ranked kid-friendly spooky movies that were available only on streaming services. Our second report considers any Halloween movie for kids that’s available to buy, rent, stream, or watch on live TV. US Census Bureau: Table QT-P10 Hispanic or Latino by Type: 2010. Retrieved 11 September 2018.